At last year’s Digital Signage Expo, Intel and Google raised some industry eyebrows as they used the wintry DSE 2014 show in Vegas to try to place their stamp on the industry. Google was literally in the (big) Intel booth at last year’s DSE, and a variety of analysts tried to Kremlin watch as to what partners were in the Intel-Google booth, when, standing next to whom and for what reason. 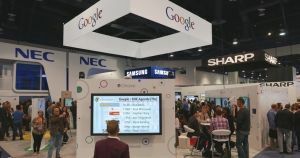 It was refreshing to see a larger player such as Google enter the market, and at this year’s DSE, kicked off today in Las Vegas, Google is back with its own booth, and is trying to make inroads into a digital signage landscape that is still dominated by variety of mainly Windows or Android platforms. Google's logo is now in the mix on the show floor at the Digital Signage Expo along side the other big players in this still double-digit growing industry. Google, confident enough to go solo at DSE, is hoping to leverage their broad footprint to offer a multi-leveled digital signage solution. Chromebox is of course the Google-branded and supported device that runs the Chrome OS. In their model, a digital signage system would have a bunch of Chromeboxes or other Chrome OS devices running all the screens, i.e. acting as what our industry calls media players. Google is hoping more companies like RiseVision– who were one of the first digital signage content management software companies to move to the Google model– write content software to run with the Chrome OS, and then digital signage deployers layer that content on top of Google’s Web based console, called Chrome Management, tethered to Google Cloud. Google’s Chrome Management Console is the key to both bringing in new software partners like RiseVision for Google, and to gathering a per-device console administration fee when the system is deployed. The model of course advertises the advantages of using Google Cloud to house the content: easy software updates, multiple layers of security, virus protection, massive file size storage. And Chrome Management can handle as many Chrome OS media players on a network as you can put out there. But the emphasis here is on management. Content running on a Chromebox is no big deal– there are hundreds of cheaper Android or other media players out there. But it’s the ability to have IT manage and control an entire enterprise wide digital signage system using Google tools they are already familiar with, that’s appealing, and the ability of IT to lock down tight all control over a Google-based system. At the end of the day this is not about a better technology platform– there is no one-size-fits-all in this industry. It’s about having Google use their marketing breadth to bring in new customers. Millions of new customers? If Google can sell digital signage services to more customers (even a tiny fraction of all of their Google Cloud customers for example), then their software partners benefit. And display manufacturers benefit buy selling more commercial grade (hopefully) screens. (Although some well known LCD display manufacturers who are married to Android may not be thrilled– that is unless a massively rising tide of demand lifts all boats Android, Windows, Linux, and more). At the Digital Signage Expo today Google announced that under its “Chrome App Builder” several third party partners have built solutions including Stratos, Rise, Arreya, Wondersign, Four Winds Interactive, Scala, and Industry Weapon. Of course, there’s no shortage of Digital Signage Apps in this industry, or screens, or content management tools. Every few years there is a rallying cry to get behind the latest easier, simpler protocol– HTML5, Android, SoC– and a lot of companies jump on the bandwagon. But the industry has historically not been prone to consolidation on one platform, and converts to a new platform are typically adding to their multi-platform arsenal in an attempt to both appeal to a wider base and future-proof their business against any outcome (but note that Google's list of partners this week includes a lot who don't do Android or other platforms). Google may have luck, but it won’t be because this show rallies behind them this week. Some here will, because they have an interesting offering. But some won’t– as there are also exciting things going on in the world of SoC (system on a chip offerings from Samsung, and LG, for example). And while Windows may seem to some like an older platform, Microsoft with new Windows 10 products for the IWB (Interactive White Board) market is also looking to enable users to seamlessly integrate across devices and platforms (imagine an IWB with collaboration and even remote collaboration features way beyond a “digital signage screen” but that can also be flipped to be a wayfinding device or a Donor Board in the school’s lobby for a special event). And note that Microsoft recently announced that a free-of-charge cloud-based Office 365 is now available worldwide– adding to increased competition in the cloud-managed space where other giants like Apple and Amazon also seek to broaden their appeal and compete with Google. And don’t get me started on the new gen LED screens we’re seeing today at DSE– and I mean direct view LED, not “LED-backlit” LCD screens. Big screens, here we come, with 4K in the mix too. So there's a renewed interest in high end digital signage with imaging, video, and graphic support at the highest HD and even UHD levels. Google’s success– like that of the other giants mentioned above– will more likely come because they know where a whole lot of end-user customers are, and can figure out how to market new things to those users.